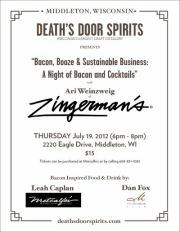 Join the Death’s Door Team at the Middleton Distillery, local chefs, and Ari Weinzweig for a great event! Ari Weinzweig w ill discuss with guests the Zingerman’s approach to food and business with some key points from the company’s three (3) books which Ari will also be signing afterward. The discussion and book signing will be accompanied by cheese from the Wisconsin Milk Marketing Board, bacon, and bacon appetizers from Chef Leah Caplan of Metcalfe’s and Chef Dan Fox of The Madison Club with cocktail pairings by Death’s Door Spirits and local mixologist Chad Vogel. Thurday, July 19th, 6-8pm. Cost is $15 for the discussion and food & drink.